Charles Davis commonly does rhinoplasty both for cosmetic reasons and for reconstruction after nasal fractures, cleft lip and other craniofacial conditions. He has recently stopped doing minor cosmetic nasal procedures but is happy to continue to do rhinoplasty for cases with major disfigurement. A beautiful nose is balanced with the rest of the face. Breathing may also be improved at the same time with surgery to the inner structures (septum and turbinates) if necessary. The cost of a rhinoplasty depends on what is done at the time of surgery. This varies because some people have minor tip work done and other people have major bone and cartilage reshaping. We give everyone a firm price once we have examined them and know the likely theatre time and consumables to be used. 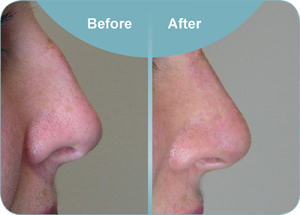 For the range of recent rhinoplasty costs please either email us or phone us on 0800 268 526. Can I see examples of Charles Davis rhinoplasty surgery? Examples of rhinoplasties performed by Dr Davis are shown during a consultation to illustrate specific anatomic features, the typical range of results, the limitations of surgery and the placement of the scar. What is done during rhinoplasty surgery? Nasal function includes airflow through the nose and may be altered by manipulating the internal nasal valve, the alar, the nasal septum or the turbinates. The surgery is done at Boulcott Hospital in Lower Hutt, Wellington. Most people go home the following day. For most people there is plaster splint on the nose. We remove this along with some stitches six days after surgery. All the stitches inside the nose dissolve. Many people return to deskwork at this time but you should expect to feel fatigued for a few weeks. You need to avoid heavy lifting and bending over and straining in the first few days after surgery. People interested in the surgery can be sent the Australian Society of Plastic Surgeons information sheet about rhinoplasty, which has a good overview of what is involved with the procedure as well as potential risks and complications of surgery. Email or phone us if you would like a copy. Potential complications include unhappiness with the final shape, the late appearance of surface irregularities and difficulty breathing through one side or both. Numbness for some time and swelling that can take a long time to fully settle is common. About 1 in 20 people may benefit from a reoperation to further improve the outcome.